Our product range includes a wide range of sennheiser dual sided wide band headsets, sennheiser usb headsets, sennheiser sc 262 and sennheiser sc 60 usb ml headset. 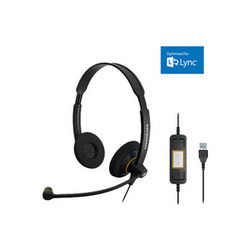 Headset with Microphone is a deployment-friendly, dual-sided wide band headset optimized for Microsoft Lync. With integrated call control unit and USB connector the SC 60 USB ML offers great functionality and convenience with the added benefit of Sennheiser stereo sound. It is specifically designed for the Unified Communications market, where Sennheiser HD voice clarity and maximum call-handling flexibility can make a genuine difference to productivity. Optimized for Microsoft Lync integrated call control and USB connector Sennheiser HD voice clarity wide band sound for a natural listening experience Noise canceling microphone makes speech transmission crystal-clear and suppresses ambient noise in offices Dual-sided wearing style for stereo. HD sound reproduction even in noisy environments High-Comfort large ear pads in an ultra lightweight headset for relaxed wearing Solid construction crafted with look and feel in mind Bendable boom arm ensures microphone position is always optimal. One can experience clear-quality internet chats, casual music and more with the affordable Headset with Microphone featuring a Sennheiser USB sound card. Plus, with its handy in-line volume/mute control, you have the ultimate in convenience no need now to fiddle with your computer’s settings. Renowned Sennheiser stereo sound and the high quality noise canceling microphone ensures your conversations are clear. Leveraging on our industrious professionals, we are offering a supreme quality range of Sennheiser SC 262. It is designed for professionals that require HD voice clarity in busy contact center and office workplaces. 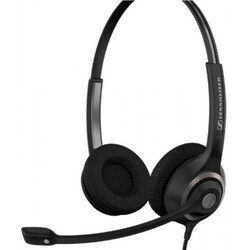 In order to provide an excellent range to our clients, this headset is designed by employing sophisticated technology by our vendors' professionals. Our entire range is offered in several models and other related specifications, as per the variegated requirements of our valuable clients. 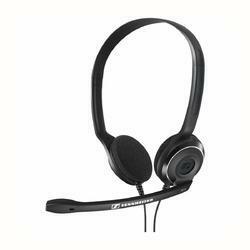 From our wide range of products, we offer optimum quality Sennheiser SC 60 USB ML Headset. The entire range is designed using premium quality basic material and the latest technology by our vendors' experts. We offer the entire range in different sizes and various specifications, as per the ever-evolving needs of our prestigious clients. Moreover, our offered range is rigorously tested by experts on well-defined parameters, in order to deliver a flawless range at our client's end.